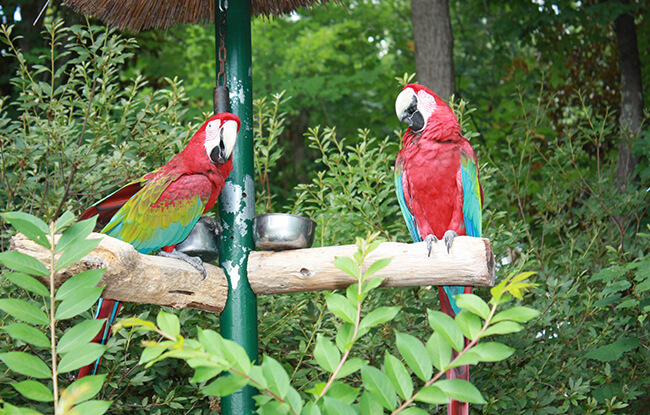 You might have seen the birds on display at The Island, but seeing the parrots of Parrot Mountain in their “home” environment should be on everyone’s to-do list when visiting Pigeon Forge. 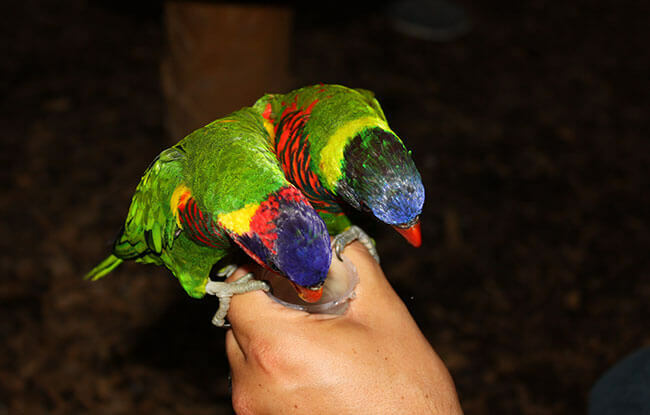 It’s an enjoyable and relaxing experience, and you’ll appreciate the way the birds of the park are taken care of and the way they live. You can even help feed some of the birds! Parrot Mountain is easily seen as you approach Dollywood, with huge lettering like the “Hollywood’ sign. As you take the scenic drive up to the top of the mountain, excitement grows with anticipation. From the parking lot, you see what I like to call “free-range” parrots. They aren’t tethered or caged but enjoy sitting on their perches, enjoying the scenery and available food from the perch. When you enter, you’ll see the gift shop and restaurant to the left, where you can get a bite to eat if you’re hungry. Even if you aren’t hungry now, you should work up an appetite because they have the best hamburgers, ever. The thick and juicy Angus beef burgers have been perfected over a decade by the owner Fletcher and his wife. They have birds on the path that leads to the gift shop, including a very friendly cockatiel. 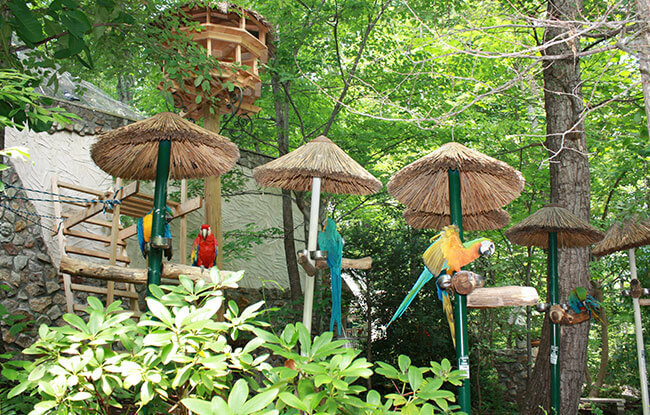 There are also birds inside the gazebo area where you can enjoy eating your burger, although they aren’t real, so don’t expect an interaction! As you follow the path through the gardens and park, you’ll see parrots, toucans, cockatiels, and even Australian Lorikeets that will drink nectar from a cup you can hold in your hand. 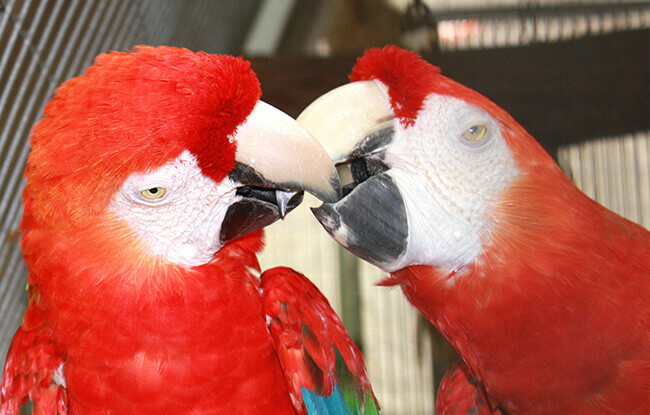 Many of the birds are rescues or donated. As you journey, you’ll see Biblical messages, themes, and statues throughout. When we visited, our daughter was given some food to feed the crow they had in one of the caged sections of the park. In general, however, most of the birds I saw were able to roam freely, especially in the section they call the “Secret Garden.” A highlight was being able to do the photo shoot with as many birds as we could fit on us (for a fee), but there are areas where staff members will let you hold a parrot or let one sit on your shoulder for free. 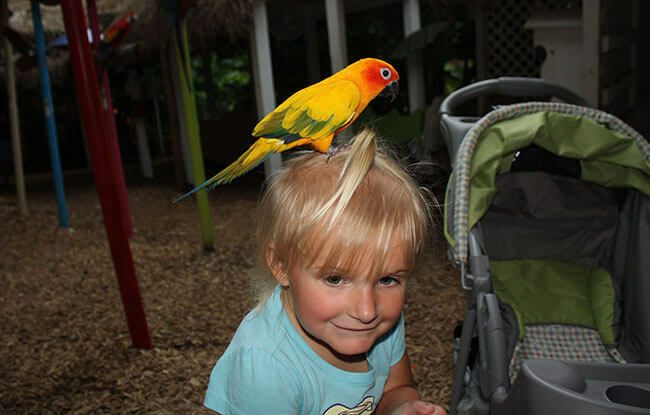 Our daughter got an experience of her own, with her head being a perch! Unfortunately, we weren’t able to stay quite as long as we would have liked due to some thunderstorms entering the area. I would recommend you allow at least 2–3 hours to get the most out of the location. Take your time and enjoy it. It’s a beautiful place, and you’ll have an experience that is hard to come across again. If you’re an animal lover, I highly recommend you visit Parrot Mountain. It’s a wonderful place to experience when visiting Pigeon Forge and the rest of the Smokies!